Vulpes is a genus of the Canidae family. Its members are referred to as ‘true foxes’, although the common names of species in other genera include the word ‘fox’. True foxes are distinguished from members of the genus Canis, such as wolves, coyotes, and jackals, by their smaller size and flatter skulls. 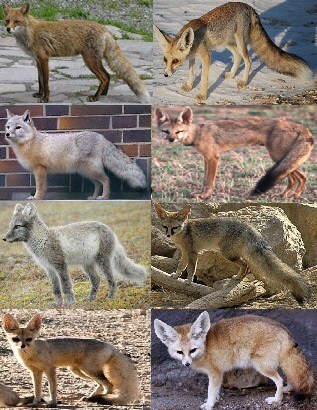 They have black, triangular markings between the eyes and nose, and the tips of their tails are often a different colour from the rest of their pelts.